“Master of Dance” is a new dance show that’s not a reality show, but a dance game show. Hosted by Joey Lawrence, it premieres on TLC next month. This will be the network’s second game show. The scene on set is a mock dance club. Audiences are made to stand throughout the whole time of filming. Contestants are introduced onto the stage as average folks from all walks of life who think they happen to be the best dancers in their circle of friends. The show is divided into four rounds. Contestants are judged based on best dance technique and staying true to dance styles within the eras they are given which include: 1980’s (Michael Jackson), disco, M.C. Hammer, and 1960’s (Elvis’ Jail house Rock, and Chubby Checker’s The Twist). A panel of celebrity judges are: choreographer, Tyce Diorio, former Solid Gold Dancer, and star of the Breakin’ movies from the 1980’s, Lucinda Dickey, and comedian, Loni Love. In the final round, dancers are forced to do a finale dance-off against each other. The winner is picked by the judges. Six consecutive shows were shot at KTLA studios, one of which is the finale where the grand prize of $50,000 is given to the “master of dance”. 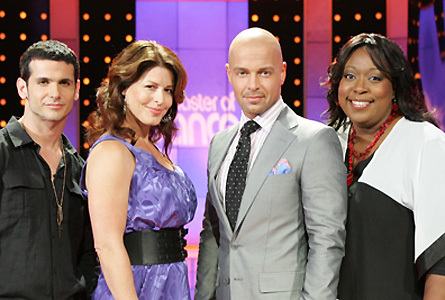 One winner is chosen at the end of each episode to go on to compete for the $50,000. Most of the winners selected were blatantly denounced by the audience who loudly booed most of the winners. However, once the show goes to air, I’m sure viewers at home will hear cheers from the audience from footage shot separately by producers. In several cases, clearly the better dancers from their groups were sent home which, again, lead to a lot of disgruntled audiences. Again, subjects of the show are average folks who think they are all the rage at night clubs and barbecues. “Dancers” tended to be women in their thirties. Any male dancers, who showed any spark of real talent, were quickly sent packing. Male dancers who were not very talented, stayed to compete. In one incident, celebrity judge, Lucinda Dickey, commented on one male dancer who happened to be the best dancer on the show period, that his “Michael Jackson” dance was not very good. Yet, to a female dancer who did okay, Dickey spoke very highly of her dance style. I’m guessing that the shows demographic audience is women ages 32-55. Too bad there’s not a Standards and Practices for “fair judging” on a game show.